< Make Your Own Pasta Recipe!! I am one of those people who take the Christmas decorations down and then feel glum at how bare the room looks. Of course it’s nice to have less clutter, but you also notice the bits of paintwork that need retouching or in my case the radiator cover that’s seen better days. I had a lovely red mantle place runner across it all through December and as soon as it came off I wanted something to replace it. So I have made my own version of a springtime runner to share with you all. First you need to measure your mantle place, both the length and depth. This is the basic size of your runner. You can draw this rectangle onto a piece of paper, or straight to fabric. Around the edge of the rectangle add flags or scallops or whatever shape you like. If you haven’t already done so transfer your design onto fabric. I chose a plain cream colour. Cut out your design. Next I edged the runner with a small zig zag stitch on the sewing machine. Of course you can hem it properly. But this isn’t an item with heavy use or washing, so as long as your neat with your zigs and zags they work very well and are very fast. The fun part! Decide on your decorative design. I chose hearts partly because I love hearts and partly because the next holiday I could think of was Valentines Day. Draw your design onto bondaweb or a similar product. If you need help with making appliques, look through the previous tutorials for full instructions. Iron your design onto fabric and cut out. Peel off the bondaweb backing paper and begin to iron your design onto your fabric flags/scallops etc. Again using a small zig zag stitch edge your applique designs. It is nice to use contrasting thread here so it stands out. 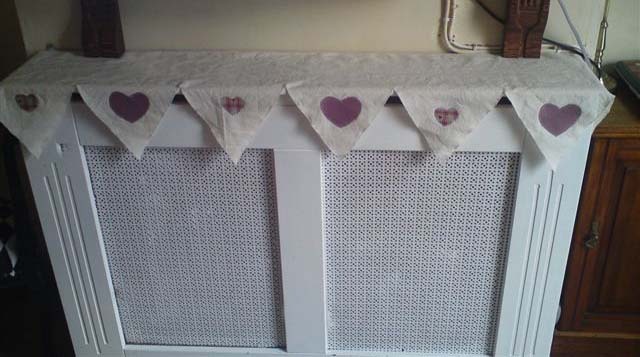 This entry was posted in Tutorials and tagged mantle place, runner, sewing, tutorial. Bookmark the permalink.